Rickettsia slovaca, a spotted fever group (SFG) rickettsiae, was first isolated in 1968 from a Dermacentor marginatus tick in Slovakia . Since then, it has been found in both D. marginatus and D. reticulatus ticks from Western Europe to central Asia. The first human infection by R. slovaca was reported in 1997 in a patient who presented with a single inoculation lesion of the scalp and enlarged cervical lymph nodes after receiving a bite from a D. marginatus tick . Later, the isolation of R. slovaca from a French patient provided the first definitive evidence that R. slovaca was a human pathogen . 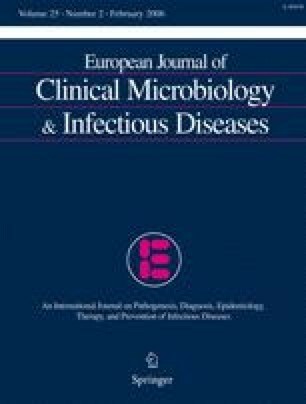 Currently, the rickettsial disease caused by R. slovaca is called tick-borne lymphadenopathy (TIBOLA) or Dermacentor-borne-necrosis-erythema-lymphadenopathy (DEBONEL) [4, 5] and its epidemiological pattern and clinical features in patients from France, Hungary and Spain are being unveiled [6, 7]. This work was supported by Consejería de Sanidad, Junta de Castilla y León and Ministerio de Sanidad y Consumo, Fondo de Investigación Sanitaria (FIS), Red Temática de Investigación Cooperativa EBATRAG-G03/057. Thanks are given to N. Skinner for revising the English version of the manuscript. The experiments described in this article comply with the current laws of Spain, where they were conducted.